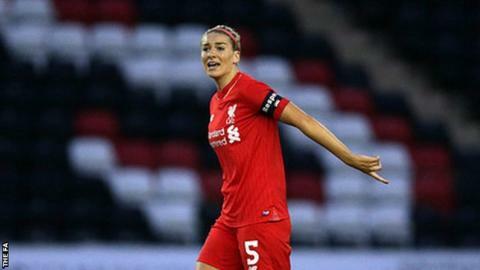 Liverpool Ladies were narrowly beaten at Brescia in the first leg of their Women's Champions League last 32 game. Sara Gama's goal proved the difference in Italy, as Liverpool goalkeeper Danielle Gibbons could only punch the long-range shot into her own net. Brescia's Valentina Cernoia struck the post, while Daniela Sabatino had an effort ruled out for offside. Natasha Dowie, Katie Zelem and Rosie White all went close as Liverpool searched in vain for an equaliser. More worryingly, with the return leg only a week away, Reds captain Gemma Bonner was forced off midway through the second half after the defender suffered a serious-looking ankle injury. Substitute Asisat Oshoala created the visitors' best opportunity, showing pace down the right wing to find Dowie inside the area, but the striker sent her shot high over the crossbar. Zelem tried her luck from 25 yards, while White forced a good save from goalkeeper Chiara Marchitelli as Brescia clung on to their one-goal advantage. Before the second leg next Wednesday, Liverpool host Notts County in the Continental Cup semi-finals on Sunday. Brescia: Marchitelli, D'Adda, Linari, Gama, Rosucci, Cernoia, Bonansea, Eusebio (Boattin 81), Sabatino, Girelli (Alborghetti 56), Tarenzi. Subs not used: Ceasar, Serturini, Ghisi, Lenzini, Mele. Liverpool: Gibbons, Harris, Bonner (Beckwidth 57), Ryland, Murray, Ómarsdóttir, Zelem, Hodson (Oshoala 46), Staniforth, Dowie, White. Subs not used: Darbyshire, Pacheco, Green, Dale.